Populations (including only those aged 15 years and older) in both areas have increased by about 10% over those 10 years, but the Fredericton region labour force has only increased by about 2% whereas the Moncton labour force has grown by over 10%. Employment (net job creation) in Fredericton has grown by only about 2% compared to over 10% in Moncton. 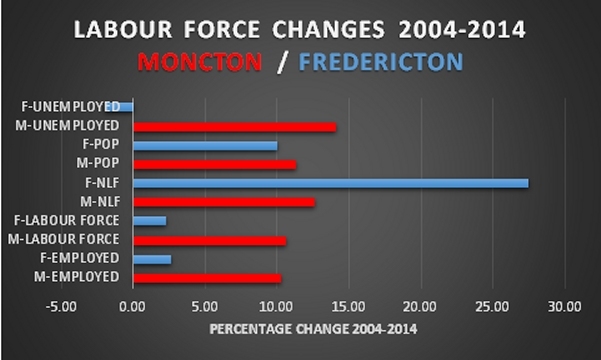 The most striking thing about this chart is the difference between Moncton and Fredericton with respect to changes in the NLF (not in labour force) variable. These are persons who are no longer seeking work. While some persons may enter and leave this category at various times of the year, the NLF portion of the population in the Fredericton region is growing. There has been a 27% increase in this category in Fredericton since 2004; only a 12% rise has occurred in Moncton. Both Moncton and Fredericton appear to have similar age profiles, so it does not seem likely that the differences are explained by retired persons moving to Fredericton (unless they are young retirees). A ‘side benefit’ of poor long-term job growth is that people tend to be less likely to move into the area in search of work. Consequently, there are actually fewer persons unemployed in the Fredericton region than 10 years ago. On the other hand, when we have a growing proportion of the working-age population in the NLF category, that might mean that we have a larger proportion of the population with limited incomes and therefore less spending on local goods and services. That translates into fewer opportunities for local businesses to see revenue growth and the hiring that comes from that growth. By contrast, Moncton has seen less change in the NLF group; that might suggest those moving to Moncton are finding work, or at least remaining in the labour force. And what about job creation? The chart below shows net change in job creation, found by subtracting current year from the same month in the previous year (again from Table 282-0054, using November data throughout), with the net change between 2004 and 2014 given in the ‘Total’ columns. Neither region has been stellar with respect to job creation, but there certainly are differences between the two. Note that negative values in the vertical axis (job creation) mean that jobs were lost compared to the previous year. 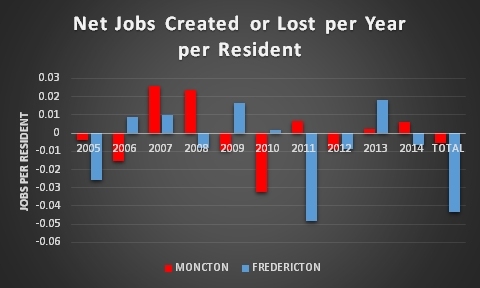 The main difference between the two regions is that, while both regions have had poor job creation years, Moncton has had a couple of excellent job creation years whereas Fredericton has not had any. The poor job creation record in the Fredericton region relative to Moncton over the past 10 years suggests that the local economy has been stagnant. Consequently, a growing proportion of the working age population has been unable to find work and have left the labour force. The story is still the same. 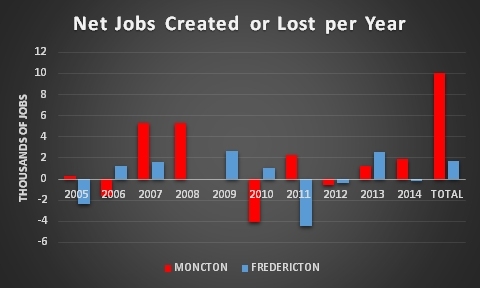 Fredericton has not done very well over the past ten years in terms of job creation. A major economic driver in this region (spending and hiring by governments) has weakened and other sectors have not been able to take up the slack. Fredericton has a significant economic problem – pretending it isn’t there is a mistake. This entry was posted in Economy, Labour by Datapoints_NB102. Bookmark the permalink.